I cannot stress the potential use of octaves enough!! 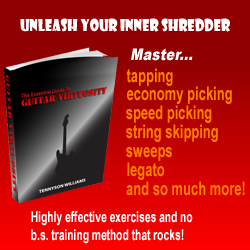 It is a common Petrucci technique to play full 6 or 7 string chords rather than power chords (IE Honor Thy Father) and to use pedal notes and open strings when arppeggiating them (Check Hell’s Kitchen). But something he hasn’t done for some reason is to use different octaves WITHIN the chords. Notice that here, I Didn’t play 12 fret on b, I went from 13 to open. Large jumps add tension and emphasis to your music (both shredding and rhythm) and I felt that here it made a better impact in that particular track. That’s the basic summary of this lesson. Consider octaves in your ballads or acoustic intros, they add tremendous stress and emotion when used properly. Hope this at least makes you guys think a bit! Time to go watch the shaft haha. Worst movie ever! Stay tuned for the next lesson which involves expanding your chromatic abilities. They aren’t just half steps people!